For the truly dedicated! 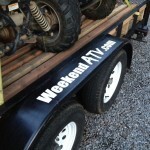 This 36-inch decal is made with 3M Scotchcal Vinyl with a 5 year life expectancy. At this size it’s perfect for your garage, trailer, windshield and dining room window! Show everyone what you do on the weekends!